Being an adult can be a very stressful way of living. 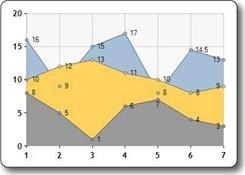 ASP.NET Razor Chart helper: What chart types can you use? I haven't tried all of them, but basically this is the list of names that you can pass, as strings, to the Chart helper in a Razor page. Actually sorting out what all these chart types are for and how they relate to your data series is, for the time being, left as an exercise for the reader. Or use the Object Browser in Visual Studio -- you're looking for System.Web.UI.DataVisualization.Charting.SeriesChartType.